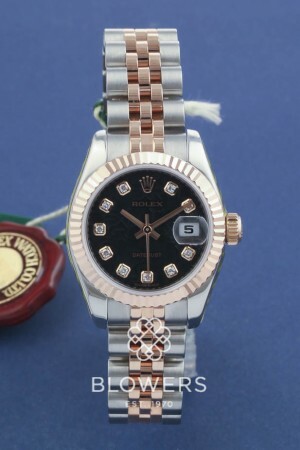 Bi-metal steel and pink gold ladies Rolex Oyster Perpetual Datejust 179171. Case diameter 26mm water resistant to 100 meters. Automatic chronometer movement. Black Jubilee dial with Diamond hour markers. Pink gold fluted bezel. Bi-metal Jubilee bracelet with concealed crown clasp. Box and papers dated October 2011. Rolex service papers dated February 2018. SKU: 3002179. Categories: Ladies, Rolex.